When you take your car to a mechanic, the place usually has a free shuttle that brings you back to your work or home while they do their work on your car. So why don't bike shops have a bicycle service that takes you back to your work or home while they do their work on your bicycle? Do they assume everyone drops off their bicycle in a car? Well, as I was walking back to work after leaving my bicycle at the shop, I saw this guy. I also had a nice conversation with a woman who was working on her sidewalk garden. Walking does have it's advantages over bicycling, the biggest being the amount of time your eyes and brain have to focus on things or people. So a bicycle-cab ride back to work from the bike shop would have been nice, I thoroughly enjoyed the walk. I think at least one bike shop in Boulder offers loaner bikes. 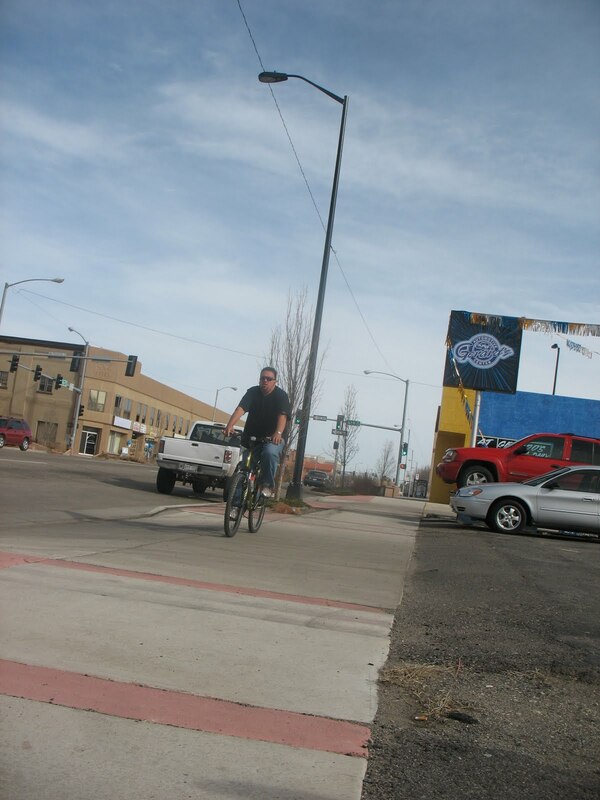 Possibly more people in Boulder bike long distances. I know that a lot of people in east Boulder County have bike commutes of ten miles or more into the city. I agree that to actually know an area, walking is best. And for meeting people, the bus is best.